The goals of rhinoplasty are to redefine the nose into a pleasing shape that complements your facial features. Finding form and function is the key here. 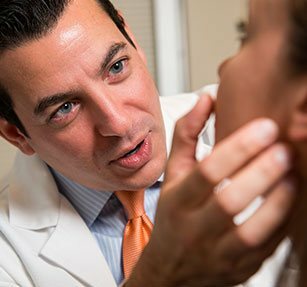 As no two faces are alike, neither should be the approach to rhinoplasty. Dr. Ezzat believes that this is a team effort, listening to your concerns and tailoring your plan to fit your needs is the basis of his philosophy. For some, the tip of the nose can either be too wide (or bulbous), asymmetric or give the appearance of a droopy tip (also called a ptotic tip). Making minor changes along the cartilages of the nasal tip can have small but profound changes to the overall appearance of the nose without giving it the “plastic” look. For others, a hump along the nose (called a dorsal hump) can be the main culprit and give the illusion of a droopy tip and/or stubby nose. Refining this hump, while keeping the rest of the nose in harmony with your face, is crucial to giving a natural look to your face. While these are only a few examples of approaches to a rhinoplasty, there are many different types/shapes of noses and each one belongs to a different face. Therefore, a customized approach to each patient is the hallmark of Dr. Ezzat’s practice. Making the right changes to your nose (so that it complements your face) will help ensure you get the most natural look possible after surgery.